Democritus was a pre-Socratic Greek philosopher. He was born at Abdera in Thrace and lived from around 460 B.C.E. to 370 B.C.E. Democritus developed atomism which originated with Leucippus. Democritus identified the real existence of the cosmos with infinite numbers of permanent, imperishable, immutable, and indivisible elements called “atomon” (atoms; means “indivisible”), conceived the world as the composite of these material elements, and developed purely mechanical materialism, devoid of any trace of the mythical, which is rare in Greek philosophy. All atoms are qualitatively homogeneous, different only in form, shape, and size. The qualitative diversity of the world is reduced to and explained by quantitative and physical differences. From physical phenomena to perception and thinking, all phenomena both physical and spiritual were explained by mechanical materialism. This was the first purely materialist thought in the history of Greek philosophy. It is virtually impossible to tell which of these ideas were unique to Democritus, and which were attributable to Leucippus due to a lack of surviving fragments, aside from ascribing the originator to Leucippus and the successor to Democritus. Details of Democritus’ life are unknown due to a lack of surviving texts. It was known that Democritus produced works on a wide range of subjects, and that Thrasyllus, a first century Roman scholar, arranged his writings which included works on ethics, natural science, mathematics, music, and technical matters. Nothing survived except a limited number of fragments. His atomist ontology and hedonism was succeeded by Epicurus. 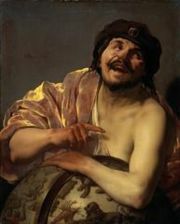 Democritus is said to have had a happy disposition, and is sometimes referred to as the "laughing philosopher," as opposed to Heraclitus, who is known as the "weeping philosopher." In the Divine Comedy, Dante sees the shade of Heraclitus in Limbo with those of other classical philosophers. Atoms are in constant motion. Democritus argued for the reality of “void” that gives space for atoms to move. When the atoms move they come into contact with other atoms and form bodies. A thing comes into being when the atoms that compose it are appropriately associated, and passes away when these parts disperse. This leaves no room for the intelligent direction of things, either by human or divine intelligence, as all that exist are atoms and the void. For Democritus, the entire world is physical material organized by mechanical physical principles. Democritus argued that atoms only had several properties, particularly size, shape, and mass; all other properties that we attribute to matter, such as color and taste, are merely the result of complex interactions between the atoms in our bodies and the atoms of the matter that we are examining. Different tastes are a result of differently shaped atoms in contact with the tongue. Smells and sounds are explained similarly. Vision works by the eye receiving "images" or "effluences" that are emanated by bodies. Democritus stated, "Sweet exists by convention, bitter by convention; color by convention; but in reality atoms and the void alone exist." This, of course, means that the senses cannot provide a direct or certain knowledge of reality. Democritus gave a materialist interpretation to the soul, which he contends is composed of exceedingly fine and spherical atoms. He holds that, "spherical atoms move because it is their nature never to be still, and that as they move they draw the whole body along with them, and set it in motion." Democritus identified the good with “pleasantness” and developed a form of hedonism. Pleasantness is achieved by observing justice, controlling desires, and keeping a balance in life. While Democritus held a radical materialism in ontology, he developed a secular idealism in ethics and left a number of maxims for life. "Disease occurs in a household, or in a life, just as it does in a body." "Medicine cures the diseases of the body; wisdom, on the other hand, relieves the soul of its sufferings." "The needy animal knows how much it needs, but the needy man does not." "It is hard to fight with desire; but to overcome it is the mark of a rational man." "Moderation increases enjoyment, and makes pleasure even greater." "It is childish, not manly, to have immoderate desires." "The good things of life are produced by learning with hard work; the bad are reaped of their own accord, without hard work." "The brave man is he who overcomes not only his enemies but his pleasures. There are some men who are masters of cities but slaves to women." "In cattle excellence is displayed in strength of body; but in men it lies in strength of character." "I would rather discover a single cause than become king of the Persians." Bailey, Cyril. The Greek Atomists and Epicurus (Oxford: Oxford University Press, 1928). Barnes, Jonathan. The Presocratic Philosophers revised edition (London: Routledge, 1982). -----, 1984, ‘Reason and Necessity in Leucippus,’ 141-58 in Linos G. Benakis (ed. ), Proceedings of the Ist International Congress on Democritus vol. 1 (Xanthi). Furley, David J. Two Studies in the Greek Atomists (Princeton, NJ: Princeton University Press, 1967). -----, The Greek Cosmologists vol 1: “The Formation of the Atomic Theory and its Earliest Critics” (Cambridge: Cambridge University Press, 1987). This page was last modified on 3 November 2017, at 16:26.